A comfort object, transitional object, or security blanket is an item used to provide psychological comfort, especially in unusual or unique situations, or at bedtime for small children. Among toddlers, comfort objects may take the form of a blanket, a stuffed animal, or a favorite toy, and may be referred to by English-speaking toddlers as blankey and lovey. Unlike most toys that are briefly used then forgotten, children form intimate relationships with their stuffed animals and blankets. They rely on them for comfort and seem to be attached at the hip. And the good thing is that stuffed animals are actually good for children. And oh yes . . . they are good for teens and adults as well! A study published by Steir and Lehman in 2000 shows that when students are faced with unfamiliar and uncomfortable situations, they often use soft objects, such as stuffed animals, to decrease stress levels. Stuffed animals have the ability to make children develop at a faster pace and become more independent. The moral of the story is that every child should have a special stuffed animal to support and comfort them. Such a small thing makes such a big difference. 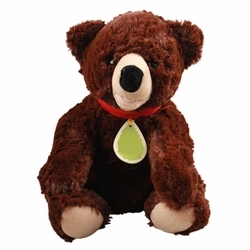 Give your child happy memories of childhood with this cute stuffed toy. This PP cotton stuffed toy will have your child laughing with joy as he cuddles with this lovely animal. This pink deer is so trendy with her pink hair, made-up eyes and a leather jacket (faux leather, but so what?) Your fashion diva is sure to love her counterpart in the stuffed animal world. The sweetest and daintiest stuffed toy animal in the world - the Mashimaro Rabbit. With fur as white as snow, this adorable rabbit looks so cute with his bonnet in blue or pink. This rabbit is so huggable. Soft and huggable pillows that are characters in themselves and which bring so much love and comfort to kids throughout the world.